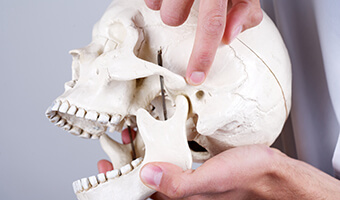 The temporomandibular joints (TMJ) are the tiny connective tissues that attach the jaw to the skull bone. When these joints are strained or damaged, the result is TMJ dysfunction (TMD). This may lead to a number adverse oral health effects, but most commonly, patients experience jaw pain. Those who suffer from TMD may not know the cause of their discomfort or limited jaw mobility, but with accurate diagnosis, we can provide adequate treatments to relieve pain and renew patients’ jaw movement. Contact our team to find out more or schedule an appointment today. 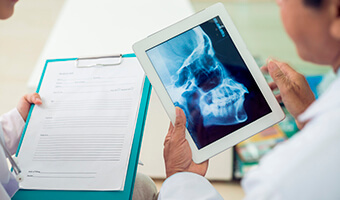 Once we diagnosis TMD, we’ll work with you to create a personalized treatment plan to relieve pain and allow you to speak, chew, and smile without discomfort. As we do for all restorative dental care, we’ll begin treating TMD with the most conservative solution. If these conservative therapies prove ineffective, we will move on to more advanced treatment options. For many patients, a few simple, comfortable daily jaw stretching exercises will significantly reduce TMD symptoms. For others, we may need to provide more advanced orthodontic treatments to reposition the jaw in a more comfortable resting place. That could include braces, retainers, or other orthodontic appliances that equalize the pressure across the bite preventing jaw joint strain or damage. In severe cases, we may also recommend surgical treatment or other advanced therapies in partnership with surgeons or other specialists. Many patients experience TMD due to unconscious or excessive jaw movement or habitual positioning of the jaw in a resting position that strains the TMJ. For these patients, a custom occlusal splint may provide pain relief and improved jaw function. These nightguards are worn during sleep, and they are precisely crafted to shift the jaw into its ideal resting place. By allowing the jaw to rest comfortably during sleep, occlusal splints reduce unconscious jaw movement and unnecessary strain on the jaw during sleep. Over several nights of wear, patients typically report significant pain relief and restored jaw function. When worn nightly for several weeks or months, most patients notice their jaw joints are naturally resting in this more comfortable position. Long term, occlusal splints may offer a true repair for damaged TMJ. 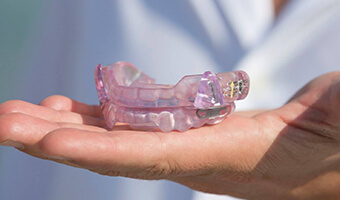 These guards are also beneficial if TMD is caused by nighttime teeth grinding and clenching known as bruxism.